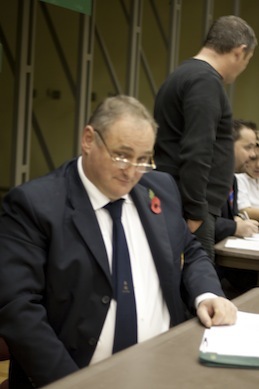 Hanshi Brian Herbert, 7th Dan, Chief Instructor of Jikishin Ju Jitsu Association, opened the Seminar and Competition by welcoming both students and spectators to the Annual International. He then invited Sensei Vince Bull to take over the microphone as compere and to make the introductions. These included Sensei Steven Van Hauwermeiren, 6th Dan, Sensei Leslie Ottoey, 8th Dan, Sensei Ricky Izod, Sensei Chris Sheppard, Sensei Graham Sergeant, Sensei Colin Humbles, all 5th Dan. Sensei Vince then invited Sensei Grant Wakeman, 4th Dan, to take the Warm Up. Wearing his very fetching Blue Gi and on a raised platform so we could not miss him, he donned the headset and enthusiastically took us through a series of drills encompassing kicks and punches and more so we were warmed up and loosened up for the seminars to come. Our gratitude for Sensei Grant’s routine was even greater when he did not make us do 100 Press Ups, 100 Crunches and more that usually form the Conditioning enjoyed in club training. It also meant we had sufficient energy for the morning seminars and the afternoon’s Competition. Onto Black Belt 2 mat I joined Sensei Trevor Wickett and Sensei Mick Morrison and espied, amongst many others, Sensei Steph Mindel training with Sensei David Tedora, Sensei Rick Alder, 4th Dan – an imposing sight – training with anyone close to him. The virtue of the seminar work is to enthuse the student and invite his or her Imagination to take flight while trying to emulate the techniques shown by the many Sensei. This also prompts thoughts to oneself, usually along the lines of: How did he do that? It’s a thought that frequently comes to Mind as I watch something I can’t do: yet it is taken into the Imagination and often emerges later on in club training as part of a similar technique or as element of a Locking Set or Wrist Application. So, the student has already been prepared but unaware. By chance, this occurred in the seminar. 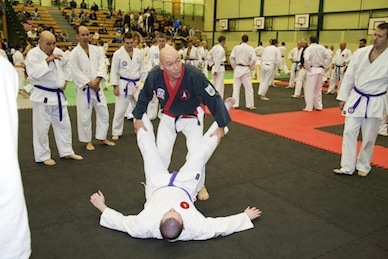 A Stick Technique in which a Block and Strike developed into a Throw was demonstrated by a senior Belgian Sensei. I was agape as it was exactly that which I had executed in a past Grading. Clearly my technique was not unique to me as I thought it was – though it did signpost that I was on the right track, so I take comfort in that. Also that nothing is “New” and others have been of a similar mind on their Ju Jitsu journey. This almost happened again when Sensei Chris Sheppard took that mat and demonstrated an Escape from a Double Wrist Grab. I say, “almost” as I have had a similar idea in mind but only in outline. Sensei Chris actualised it in a Complete Technique and Finish, which I had only sketched out in rough thinking. So, I’m grateful for that and it gave me a technique to take from the Seminar. Remember, you’re lucky to take 1 or 2 techniques from the welter of instruction. Incredibly, the course gave me 10 (I think…). I only now need to practise, practise, practise in club with someone gullible enough to let me – sorry, generous enough to lend me their person to practise. What else did I try to take in? Well, Sensei Steven Van Hauwermeiren demonstrated a Ground technique from a Strangle between the legs. He took a light hold (always a warning sign from those who understand Groundwork – Sensei Willie Murley told me that sometime ago). It bore fruit. Sensei Steven controlled the Attacker and working through an evolution of Checks, Holds and more, ended with a Classic Finish of a Triangle. How did he do it? The Answer is: Cleverly. This is not a Teach Yourself manual. A very affable and good-humoured Belgian Sensei stepped on and asking for a volunteer Uke. From a Roundhouse Right Punch, he issued a Left Swan Block and moved into the Devil’s Handshake. Hmm, there was something missing from what I could see. What was it? He then repeated. No, something going on. Still don’t know. He repeated. Ah, I heard something. He repeated. Have you got the idea yet? No? Well, now you know what I was thinking. In fact, he had consistently issued a Distraction Slap/Strike to the Face as he did the Swan Block. He was so fast that I could not see it but I had heard it. Wow. An invaluable lesson for all of us. 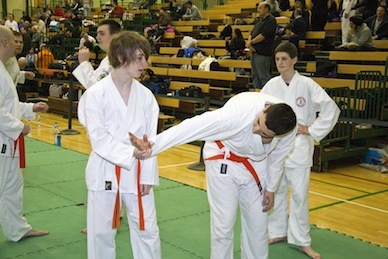 Whilst this was going on, Sensei Colin Humbles was assailed by loads of kids. Yes, he was teaching all of them and from the peals of laughter, they were enjoying their discovery of Ju Jitsu. 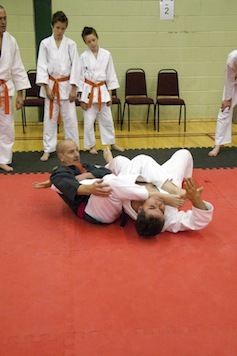 Sensei Ricky Izod took the mat and using Sensei Rick Alder as Uke, accepted a Double Punch which he turned into a Double Armlock similar to Variation of Shoulder Throw from Green Belt. He then turned and locked both Arms whilst retaining with his Right Hand so freeing his Left Hand for a Strike at his choosing. From a second Double Punch, he issued Double Swan Blocks and in a controlled manner, placed the Uke in a Stack, Reversed him and then moved through a variation of Double Shoulder hold-down into a Crucifix Finish, with Strangle/Choke. Superb. Do you want to know how he did it? Well, go to his Club and train. You will thank me afterwards. 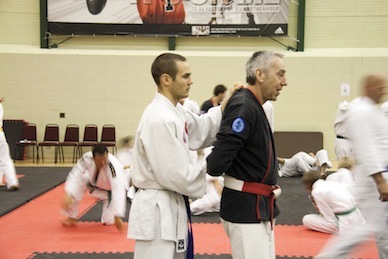 Sensei Graham Sergeant took the mat. I was grateful for this, as I thought I might “borrow” any Hojo (Belt/Scarf) techniques he might show. No, this did not happen. I was completely caught out as he did a terrific Take down in which he then Fixed the Uke with a Reverse Back Hammer using his Leg. From this, he then executed some 11 Locks in sequence in which he turned the Uke…well, I do not know, multiple times and in multiple ways. While I was agog at this flowing sequential locking set, I was thinking something along the lines of “this is far too complicated to write this one down”, Sensei Graham bounded over and with a smile on his Face and said, “Try writing that one down!”. Well, I freely admit Defeat to that. Great Stuff, especially when he repeated it on others who were not me. Sensei Brian did a very fast Hands set from a Strike and then moved in a Takedown. Now, this looked like a standard double wrist lock allowing use of Pressure to fix the Uke. In fact, it turned into a Masterclass by Sensei Brian. The grip he employed allowed correct use of musculature so as to minimise his effort to retain Control of the Uke. This let Sensei Brian evolve into a Finish, whilst NEVER losing Control. For many of us, we had not realised or had forgotten the antagonistic nature of certain muscle groups. This meant that when we tried to emulate Sensei’s technique we were unable to retain a complete maintenance of Control and so relied on Speed or Strength to fudge our transitions. Sensei’s master class was worth the price of admission on its own. A short break for a quick lunch was followed by a March-In of the many clubs of Jikishin. This also heralded the start of the afternoon’s Competition. Sadly, your Writer once again went out to a Hair Grab. I mean, really, it’s happened before. I would have much preferred being punched in the face. Anyway, I still fluked a Bronze so I’m well content. Watching the many mats, I saw an excellent Okinawan Bo 2 Kata from Sensei Sandy MacKay, 4th Dan, and he rightfully won Gold. Sensei Carrie Bywater did a splendid Sai 3 and there was more. All did equally well in the Empty Hand mat as well. It was busy so this can only be the briefest snapshot. 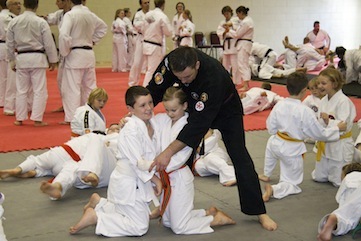 The children’s mats were buzzing with Weapons, Random Attacks, Sparring and more. Some great sportsmanship was also displayed. The Adult mats were equally enjoyable, I know because I had to judge some of them. The enduring memory is of high standards, high commitment and an enjoyable atmosphere. As the medals were awarded to the many winners (well done to you all), the International drew to a close and I went to Bas Vegas. Well, it fooled me, because I originally thought I had heard “Las Vegas” and wondered how we would get there from Southend. “Bas Vegas” is in Basildon. In fact, many of us met up in a Club called Chicago. It was great fun and I was forced to leave at 3AM. I look forward to a Return next year. My word, those Belgians can Dance! Great entertainment and thanks to everyone who made it such a memorable event for all their efforts (yes, I know about the mats, Sensei Lee Bywater, Tony Park – and the Stock table, thanks, Sensei Lorraine Egleton, Wendy Hobday, Steve Hobday all 3rd Dan) and the many helpers/stewards on the door and more. Thanks for you all. Here’s to 2011.